If you're looking for the best of all possible retreats, begin chanting softly, "Wilbur Hot Springs. Wilbur Hot Springs." Off road, off the grid, outta sight and (nearly) outta mind. Bear Valley Road is a dusty and magical trail that leads to Wilbur Hot Springs. Once you make the turn off Hwy. 20, you'll know you've stumbled upon something special. You may think you've taken a wrong turn, but believe me, nothing could be further from the truth. The graded but rocky five miles to the gates of Wilbur Hot Springs is worth every bump in the road. Precious and protected open space, Wilbur Hot Springs is its own 1,800-acre preserve. Adjacent lands are owned by the Bureau of Land Management, so there's little possibility of civilization ever finding this corner of paradise. It's like driving into heaven. Blue skies. Fresh air. Rolling hillsides. Peaceful trails. The surrounding natural beauty would surely be enough for anyone, but this was simply the dressing the gods provided and then granted Wilbur the gift of glorious hot springs. Loaded with life-giving minerals, the hot spring's sodium levels provide a certain buoyancy similar to floating in the Dead Sea. The Fluminarium which houses three long flumes (yes, tubs) where source water flows in and then out, and with them all the stresses of life in the world beyond Wilbur. Looking out on the landscape, I couldn't imagine a more perfect moment. But after soaking away all cares and woes, I opt for an Adirondack chair overlooking the seasonal creek. Ducks and wild turkeys came visiting -- and we even spot a blue-belly lizard across the way. And lucky us, a Western Tanager...one of the staff said it was the first she had seen in her 10 years at Wilbur. Magic for us all. The resort at Wilbur Hot Springs dates back to 1865. 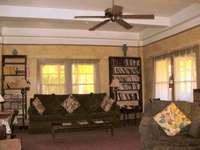 The current hotel was built in 1915 and offers numerous comfortable corners to lose yourself or spend time with friends. A magnificent lanai surrounding three sides of the hotel provides ample space to read, play games, or enjoy libations and meals. Just inside the lobby, the library has the most welcoming over-stuffed sofas and chairs for you to curl-up with a favorite book...or take a nap. Wilbur was "gre en" and sustainable before either of these things was part of our everyday lingo. I can't honestly say Wilbur is "off the grid" since quite simply they were never on it. All of Wilbur's power came either from kerosene or propane, and wood burning stoves. Today, they are the poster child for solar systems. Their electrical systems are completely powered by solar gardens with back-up (propane) generators, just in case. The old, less-efficient propane refrigerators have been replaced by lovely new electrical ones. You will leave a world of cares behind when you make this trek to Wilbur Hot Springs. And this isn't even close to being the "Rest of the Story." You really want to know more! 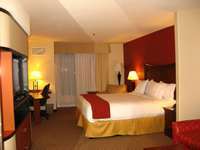 I had the opportunity to spend the night at the new (opened in late 2007) Holiday Inn Express Hotel & Suites in Lincoln, California. On the edge of a big-box store development, this is generally not the sort of place I seek out. But when opportunity knocks I am the first one to answer the door. As they say, "Never say never." A great location for a retail getaway (seriously -- tons of shopping within walking distance). And the popular Thunder Valley Casino is just down the road. However, none of these were the reason for my visit...and so I digress. Back to the "little things." When you check-in, there are plates of yummy cookies. I wasn't terribly hungry but simply couldn't resist. Okay, unexpected but not totally worthy of the "little things" award. My room was beautifully decorated...very Euro-style I must say. But then I saw it..."the little thing" that was a first for me. The pillows...matching in every way except for the distinctively embroidered - "Soft" and "Firm." Wow! And, of course, I had to immediately do a push test to see it was really so. I asked about this amenity at the front desk. I was assured that guests really love the idea and the "Firm" pillows are the most popular. Not for me -- I'll take soft and cushy every time. But then this wasn't the end of the "little thing" awards. The towels in the bathroom are marked "Simply Smart". Though this is the brand, it refers to the idea of conserving water by not having yo ur towels laundered every day. If this is the new HIEH&S brand I'd say they've done it right. So if you're visiting the region and have reason to stay...check it out! The upcoming "Feats of Clay," sponsored by the Lincoln Arts & Culture Foundation, would be an outstanding to reason to think about visiting and spending a night or two. BTW - this wasn't the end of all "the little things." That would be "The Rest of the Story" if you care to ask. In today's frantic and frenzied world, children are prisoners to life inside and regimented schedules. Adults should be responsible for making sure children know how to play outdoors. Know what it means to run, swim, hike, fish, explore and be free -- to be children. Get involved and make the difference in the life of a child. Learn more about the California Children's Outdoor Bill of Rights. Not only will it raise a healthier generation of children, but will improve the lives of adults too! With recent concerns about youth detachment from outdoor activities, lack of physical exercise and increased health risks, the California Roundtable on Recreation, Parks and Tourism adopted the California Children's Outdoor Bill of Rights for the purpose of recommending a fundamental list of experiences that every child in California would benefit from experiencing, before entering high school. Numerous studies document that children who do these things are healthier, do better in school, have better social skills and self-image, and lead more fulfilled lives. To encourage California’s children to participate in outdoor recreational activities and discover their heritage. That every child in California, have the opportunity to experience each of the activities listed within the California Children’s Outdoor Bill of Rights. Take your children, and yourself, outside into the GREAT outdoors. Looking for a fuel-friendly getaway? How about a lean, green rafting machine? In this case, Mother Lode River Center. About 50 miles from Sacramento via Hwy. 50 and incredible scenery along Lotus Valley Road to Hwy. 49. But wait! 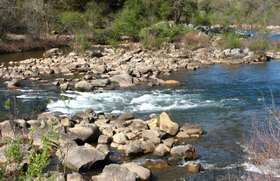 Then you have all the joy of the south fork of the American River and 12 acres stretching along a 1/3-mile of riverfront. Glorious! Plus the greenest raft company ever! How about a biodiesel-fueled EcoBus? And check-out the new Solar Energy Exploratorium. You can lodge in canvas cabin tents, dome tents, or bring your own. Great family fun and (don’t tell the kids) educational, too. Lovers, should ask about the “honeymoon” tent sites. Amenities include delicious home cooked meals from a large commercial kitchen, modern shower and bathroom facilities, riverside fire rings and river sauna. Points of interest on the camp include stone walking paths and self-guided plant tour detailing the Native American uses of indigenous plants. And Marshall Gold Discovery State Historic Park is just three miles away. Contact me if you'd like to know the "Rest of the Story." As gas prices continue to sky rocket, vacation planners will seek gas-saving alternatives. This year Big Bear Lake Visitors Center offers a free $75 gas card for guests booking three or more nights at a participating lodge, or a free $25 gas card for guests booking a two-night stay at a participating lodge. The scenery along Big Bear’s mountain highways is worth the drive in itself. Fresh air, blue skies, green pines, blooming wildflowers and mellow temperatures combine to deliver a great drive with a gas card reward at the end. Favorite springtime and summer activities in Big Bear, California include boating, hiking, off-roading, horseback riding, mountain biking, and golf. This year the fishing season is expected to get an extra boost because the lake is brim full.